The Washburn University School of Law Center for Excellence in Advocacy unites students, judges, law faculty and practicing lawyers who share interests in a broad range of advocacy-related fields of law. Participation in the Center also offers law students a guided path to future careers in advocacy centered law practice. Washburn Law has years of experience in advocacy skills training. Many noted trial lawyers and judges received their legal training at Washburn and many have returned to help train the newest generation of advocates. Talented practitioners teach a variety of specialized elective advocacy skills courses and spend time mentoring law students. From filing to final arguments, Washburn Law graduates played vital roles in Brown v. Board of Education. The 1954 case was originally filed by three Washburn Law graduates; two graduates represented the Topeka School Board at trial and another graduate, an assistant attorney general, argued on behalf of the state before the Supreme Court. From our list of impressive alumni and friends of Washburn Law, we select the Center’s Advisory Board who are among the leaders in their field of practice and who can teach students advocacy by participating in law school advocacy programs and classes. Center mentorships, court observation opportunities, seminars, lectures, skills training courses, live-client clinics and externship placements provide diverse opportunities for students to acquire strong advocacy skills. The Certificate in Advocacy is available for students who have demonstrated serious interest and skill in the art, science, and law of advocacy. 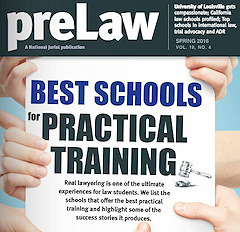 preLaw magazine lists Washburn Law, with an A rating, among the top 12 U.S. law schools for trial advocacy in its spring 2016 issue (page 60). Inclusion in the list recognizes Washburn Law's breadth and concentration of curricular offerings in trial advocacy, and availability of a clinic, externships, a center, and certificate program.